What do the parenthesis mean? I've seen that my Russian friend uses them a lot, what is its use in Russian? The same as a usual smiley , maybe :D or xD, only without the eyes. The more paretheses, the smilier. How to say "I want cats"
Super basic question. Why is it кошку instead of кошка? Кошку is in the accusative case, or, as you might say, the object or the predicate (for example, I love the cat; Я люблю кошку). Кошка, on the other hand, is in the nominative case, or subject. If I understand you right, I could say кошка люблю меня. And with the same reasoning, я is replaced with меня. You are mostly correct, except it's "Кошка любит меня." 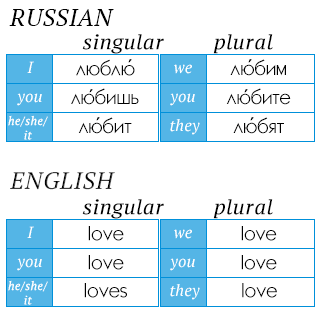 Just as we say "I love" and "He loves" with an 's', all the pronouns in Russian make this difference. The woman pronounced it Koshko, but is it more appropriately pronounced Koshkoo? [ʊ] as in English hook. Мыши! Тише, тише кот на крыше, а котята еще выше. кот ‧ 109 M ‧ www.google.com/search? кошка ‧ 44.6 M ‧ www.google.com/search? you can have mine. JK. I'll keep my koshku. As usual, no notes and no clue. Duolingo justs introduces a new word, кошку, like I have some clue. In previous lessons we had plurals so I guessed "cats" but as with most Duolingo sessions my guess was wrong. Learning by stringing together random words. Not helpful!! It is indeed different. The most straightforward role of a "patient" is the object most directly and strongly changed by the action of the verb. However, languages use "direct objects" for more than just that. For example, reading a book or hearing a sound only slightly affects the book and does not has any influence on the sound. And still, languages as different as English and Japanese treat their verbs for "hear", "see" and "read" as acting directly on these objects. However, we start with a few simple verbs like "see", "read", "write", "want", "cook" and "love", which grammatically work the same in Russian and in English. Given that you are far into your tree, you might have noticed that the verb "to listen" is not transitive in English (you listen to somenthing) but is transitive in Russian. As for "like", the Russian equivalent is more similar to the English "to seem", whereas in English the verb "like" is no different from "want" or "love". they are cases. Depends on the word being either the subject, the object etc. Take a single word, see how it behaves in different cases and try to create phrases with them. Is there a russian word for "kitten" or "kitty"? The word is котёнок. The words for kitten, puppy, piglet, calf, fox cub, bear cub, wolf cub, baby duck, chicken, fawn, foal are «котёнок», «щенок», «телёнок», «поросёнок»,«лисёнок», «медвежонок», «волчонок», «утёнок», «цыплёнок», «оленёнок»,«жеребёнок» respectively. I hope you can spot the odd one out. Everything else behaves the same, and also ends in -ята in plural (sg. котёнок → pl. котята), which is a remnant of the time -ёнок was not really there. Why cant it be,,,,, I want me a cat. Me too, computer. Me too. В русском языке эта фраза звучит бредово!!! Хочу кошку что? Съесть? Недоссказанность плохая вещь! А в "уличном" понимании слово "иметь" означает "иметь половое сношение", а "хотеть иметь кошку" означает "я хочу вступить в половой контакт с кошкой" !!! Кто-то модерирует все это? Кто-то знает русский язык на должном уровне? Can this also mean 'I want a cat'? This example sounds like I want a specific cat I see. What if I want a cat in general? У меня уже есть много кошку. Why couldn't it be "I want cat" as in "I want beef"? That's not how words work. "I want chicken", you are wrong. You can say "I want fish", "I want chicken". But when I translate this as "I want cat" is marked WRONG??? Wtf? this is speciest AF. Кошка is used in the nominative (for example, The cat likes milk). Кошки is the plural of cats (for example, The cats like milk). Кошку is used in the accusative, or you can say, the object/predicate of a sentence (for example, The mouse ran away from the cat). The sound of "у" at the end of a word is like a "u" or an "o". ? What is the plural of a cat in Russian (masculine)? Коты. only if it is the subject.